The following construction video shows how to apply Robot Millennium, a powerful Robot Structural Professional Analysis and Design software for computing the footing. Several structural engineers from all through the globe use ROBOT Millennium for its consistency as well as user-friendliness. 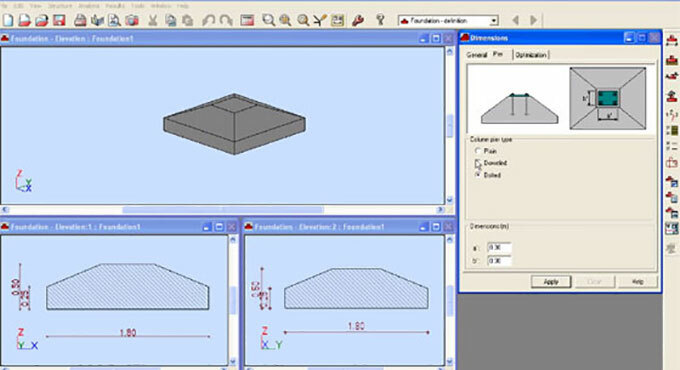 The software provides comprehensive structural analysis solution that involves frame analysis, FEM plates, shells and solid elements, as well as code checks, dynamic analysis, cables and both geometric and nonlinear analysis and various other superior features. The simple GUI facilitates the user to resolve complicated structures instantly and precisely. Watch the following online demonstration. DISCLAIMER: "Autodesk, AutoCAD, Revit, Navisworks, Ecotect, QTO, DWG, 3ds Max, are registered trademarks or trademarks of Autodesk, Inc. All other brand names, product names, or trademarks belong to their respective holders. © 2010 Autodesk, Inc. All rights reserved. Copyright © 2009-2011 quantity-takeoff.com. All right reserved.